Lift Chair Guide | Information about Lift Chairs, Medicare, and More!! Lift chairs are very important tools used by those who have difficulty standing. At The Lift Chair Guide, we have a number of great articles about senior health and elderly concerns, such as lift recliners, arthritis, and bath lifts, so please be sure to check out our Resource Centers and other senior health articles. If you need any help, have any questions, or would like to leave some feedback, please leave a comment on one of the articles or contact us. We try to respond to all emails and will attempt to assist you as you purchase a new medical device or if you just need some advice on what will work best for your situation. 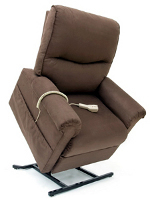 Selecting a lift chair can seem overwhelming, as there are a lot of different types and models available, but if you learn a little bit about how they work and the different types of lift recliners available, selecting the right one is not very hard. Here at the Lift Chair Guide, we strive to offer accurate unbiased information, so you can learn about how these, and other types of home medical equipment work, without having to spar with a high pressure salesman or worry about the motivations of the advice you are receiving. While lift chairs are one of the most common topics discussed at the Lift Chair Guide, we also cover a number of other health topics, including offering information about many types of senior arthritis. Please visit some of our featured lift chair and medical resources listed above and to the side, which not only discuss the devices themselves, but also include reviews of popular lift chairs and manufactures, or check out some of our recent senior health topics that are covered below! In todays world of online resellers and smart phones, finding the best possible price is often only a few clicks away, even when you are away from home! Buying medical equipment is no different and so, determining the advantages of an online lift chair store as opposed to a traditional local medical supply company, should be a consideration for anyone purchasing a lift chair. While both online and local merchants offer advantages and disadvantages, buying a lift chair online is usually the least expensive option. There are a variety of lift chair stores available and in addition to cost, selection is usually bigger at an online store. However, local medical supply stores should not be discounted completely, as they often provide a lift recliner showroom, with a nice selection of lift chairs to choose from! Many people, when shopping around for a lift recliner, often focus on cost and the type of deal they can get. While this is important and with a little looking, you can often find a great deal on a lift chair, it is also very important to consider the physical needs of the user. Selecting a lift chair that does not meet the height or weight needs of the user can not only make for an uncomfortable experience, but it can also be dangerous. As a result, not only should the characteristics of the user be taken into account, but also their needs as they relate to style and design.